Chronic neck or back pain? A state-of-the-art technology which gradually relieves nerve compression often associated with neck and pack pain. WHAT IS THE DRX9000 TRUE NON-SURGICAL SPINAL DECOMPRESSION SYSTEM AND HOW DOES IT WORK? The DRX9000 Non Surgical Decompression System is designed to provide pain relief for compression and degenerative injuries of the spine. The therapy is non-invasive and non-surgical. Spinal Decompression involves the application of forces logarithmically to elongate the spine without causing the muscles that guard the spine to contract. The technology required to apply spinal decompressive forces is very advanced. The theory behind spinal decompression is a process whereby forces are applied to the spine in a manner that maximizes spinal elongation. Spinal elongation is maximized when paraspinal muscles, the muscles that guard the spine from injury, are relaxed. When paraspinal muscles relax, applied spinal decompression forces spread apart the bony vertebra of the spine (Figure 1.). This relieves pressure on nerves and intervertebral discs. 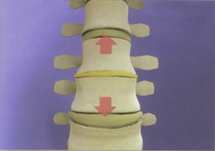 Where the spinal elongation occurs, pressure drops within the disc which facilitates movement of fluid, carrying nutrients and oxygen inside the disc (Figure 2). 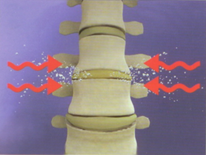 Additionally, the reduction in pressure can help draw in herniated disc fluids, reducing the size of the herniation. During each 30 minute treatment session you will relax comfortably on a heavily padded bed. After being secured into position by an upper and lower body harness, you can then completely relax by watching a DVD, listening to music, or simply taking a nap. Typically, each 30 minute session is divided into 18-phases where spinal decompression forces alternate between a maximum and minimum therapeutical level. The cycling of forces in this manner appears to create a pumping action that stimulates the natural process responsible for nourishing the intervetebral disc. WHAT TO EXPECT DURING THE COURSE OF TREATMENT? Some patients may experience light side effects with this type of therapy. Mild muscular soreness during treatment may occur. The sensation might be similar to what a person might experience at the onset of a new exercise regimen. Most patients find this therapy quite comfortable and relaxing. During an average of 30 minute sessions, most patients experience a gentle stretch in the lumbar spine and tend to fall asleep.